Assistive equipment is not cheap, it is a worthwhile investment in improving your quality of life or that of your disabled loved one. Even though some insurance policies cover the cost of some types of assistive devices and adaptive equipment, you may have to cover the cost out of your own pocket. Below some tips to help you prioritize which assistive equipment to buy for yourself, an elderly loved one, or a disabled loved one. Start by considering the assistive equipment that most supportive for independence in navigating through the home and performing personal tasks such as bathing, dressing, and going to the bathroom. Your first priority should be helping yourself or your disabled loved to achieve a higher degree of independence. Healthcare professionals who are familiar with the medical condition of a disabled person can offer highly useful advice on what assistive equipment to prioritize. These professionals include therapists (speech-language-hearing, physical or occupational therapists) and rehabilitation engineering professionals. Education professionals such as special education teachers can also help. Give preference to assistive equipment that helps the disabled person achieve to meet their individual needs. Specific weaknesses and needs can vary even between people who share the same disability, so the adaptive equipment you buy should address those specific needs. You might want to create a checklist of the disabled person’s individual needs and goals to help in guiding your purchasing decision. When it comes to adaptive technology, you can probably find a device or piece of equipment to serve any need provided you have the budget for it. However, you want to keep it as simple as possible. For example, what would be the point of purchasing a pill dispenser with a variety of bells and whistles for a disabled person who has difficulty remembering which pills to take when? A simple bill box with slots for each day and time will serve the purpose just fine. Some assistive equipment or adaptive technology appear terrific on paper, only for it not to work or suit your disabled loved one’s needs when you get home. To avoid these, ask the manufacturer or seller if you or your disabled loved one can try the equipment for some time before you make the decision to buy it. Do you know other people with disabilities or caregivers of such people? 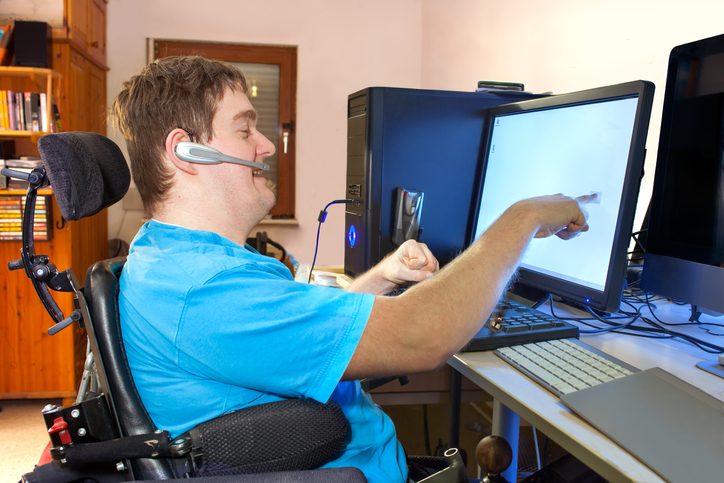 These people can offer useful recommendations for what assistive equipment to prioritize. If you don’t know these people personally, you can join online forums for people who share your challenge. People who have been down the road your currently on likely know which devices are worth spending your money on. You can’t put a price tag on the quality of life of your disabled loved one, but you still need to consider the cost because you don’t have limitless resources. Find out whether what equipment your insurance policy covers and take advantage of discounts and sales where possible.